Disarm Doors and Crosscheck: WHEN DID FLYING BECOME SO 'MEH'? WHEN DID FLYING BECOME SO 'MEH'? International flights, particularly short-haul ones, have really changed, haven't they? 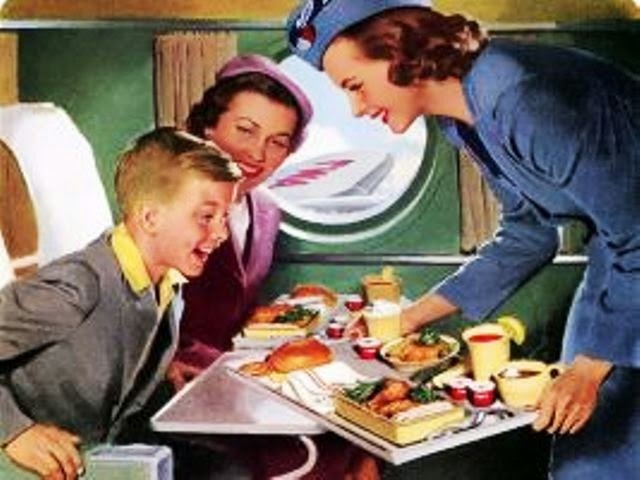 Maybe I'm being sentimental but I miss the huge, four-engined, twin aisle aircraft that operated routes from Australia, the hot meals, the giant video screens and projectors, the sense of excitement. Maybe it's all tangled up in the memories of a long-ago childhood but, sitting here in a wee 737 roaring across the Pacific, it all seems so bland now. Normal now seems to be a quick meal service. Lights out. And please don't ask for anything else. I recall a flight not THAT long ago. A 25-minute, international zip between two Asian capitals. Cabin crew pushing the meal cart up the steep incline of take-off, from rear to front, seconds after wheels-up. Hot meal. Starter, main and dessert. Passengers finishing their ice cream hastily as the crew returned with the trolley to tidy up. Again uphill. This time from front to rear. Last spoonfuls being scooped out as the tray was handed back. Too funny. Delicious too. On this flight, I've just handed back a cardboard box that contained a bag of chopped apple, two different muffins (both sweet) and a tiny ham & cheese roll, I think. Nothing really wrong with any part of it (although, I might have preferred an apple in its original state), but just a bit meh. Those childhood trips to the Pacific were, I'm happy to concede, a long time ago. And goodness knows how the fog of nostalgia is affecting my recollections, but I'm pretty sure that - back in the day - the meal twinkled with some destination reference points. Maybe some raw fish cured in citrus juice (a ceviche of sorts), maybe something coconutty at the end. But not now. I'm on a plane and I could be going anywhere. I've worked for an airline. And I'm sure that raw fish would chill a modern airline manager to the core. I get it. I get that airlines are really, really expensive to run, and they're running leaner than they ever have before. But it's still a shame. Maybe meh is just an quirk of this particular outbound service. We're flying from white-bread, keep-it-safe to an exotic, South Pacific paradise. Maybe the victuals of the return journey will sparkle with a bit more colour and light. I write this just a few days before Virgin Atlantic withdraws its services from Australia. This is the airline that first introduced seat-back TV screen, that invented Premium Economy, that offered inflight beauty therapy treatments, and reinvented the lie-flat seat. Cabin crew were encouraged to be themselves, have a chat, add authenticity to the experience of flying with them. The final service from Oz departs while I'm away. The Australian aviation market will lose lots of what's left of its lustre. Unless, perhaps, I get some raw fish on the journey home*.